The banning of eight cards in Standard (and, to a lesser extent, the restricting of Trinisphere in Vintage) has polarized the game's audience. There are those that simply love what we've done with the place, while others believe us to be insane, dumb, greedy, or some combination of the three. So what happened between December 1st and March 1st? Was Standard that bad? Was the format actually not diverse enough, and not solvable enough? Looked at purely analytically, the format probably wasn't that bad. Decks emerged that could beat Affinity. You could play something other than Affinity or Tooth and Nail and have a decent chance to succeed. If the DCI attempted to solve every issue as if it were a complicated math problem, we very well might have done nothing again. After all, banning cards is bad, and we only want to ban cards if a format was lopsided enough to warrant action, which Standard may not have been. The best deck only won X% of the time, was beaten by the second-best deck Y% of the time, and decks #3, 4, and 5 were all played in reasonable numbers. If we like the math, no problem. Just like last time. But in the past three months R&D and the DCI have been reminded that Magic is not a series of balanced equations, spreadsheets of Top 8 results and data of card frequencies. Magic is a game played by human beings that want to have fun. One of the most damning statements that can be made about a game is that it is not fun, and that's exactly what we've been hearing lately about Standard. Sure, ever since Affinity first showed up after the release of Mirrodin (and more so after it was revamped and supercharged with the release of Darksteel), people complained about it. I have plenty of anecdotal evidence in my inbox of people quitting Magic, threatening to quit, or stepping away from Standard for some amount of time because of the dark cloud of Affinity—and believe me, each of those emails made me unhappy—but recently the evidence of the general public's disdain for what the format looks like has gone from anecdotal to measurable. With some of the biggest Standard events of the year—Regionals, Nationals, and Worlds—on the horizon, how many more players could we continue to frustrate and alienate? We know what to do if a format is horribly unbalanced, but what do we do when it is equally unfun? As much as I'd like to hire clowns to make balloon animals at every Friday Night Magic, we're stuck using more traditional means of damage control—the Banned and Restricted Lists. At this point I hope it is becoming clearer why we did what we did, but I'll keep explaining anyway. Going in to our meetings that would ultimately lead to this eight-card ban, we knew the goal was to make a statement. We had to alter the reality of the format, but we also had to let the world know without a doubt that we “slew the dragon” as it were. Affinity had to go away, and everyone that was having doubts about the future of Standard needed to understand it. With that thought, we came to an agreement to ban the five Mirrodin artifact lands. Affinity had to go away, and everyone that was having doubts about the future of Standard needed to understand it. Those five, we reasoned, would do the job thoroughly—Affinity couldn't exist without its skeleton, right? We knew such a ban would affect other decks, primarily Krark-Clan Ironworks, but that deck was guilty by association as far as we were concerned. If we somehow managed to remove Ravager Affinity from the environment—and just Ravager Affinity—I have little doubt that KCI would have stepped right in to the vacated “public enemy #1” slot, won lots and lots of games way earlier than it had any right to, and still forced players to maindeck multiple copies of Oxidize, March of the Machines, and the like. Sweeping change to the format? Not hardly. So KCI getting a little residual hate was not a sticking point for us. The big issue was the one I brought up in December (and I quote): “We like to avoid having to solve problems by banning cards, as that leads to a culture of fear. We certainly don't want people to start believing that all the good cards they own are in the crosshairs of the DCI. With that in mind, can you imagine the weird backlash that would happen if we banned artifact lands? Most players that aren't into the tournament scene would have no idea at all why we did this. Tree of Tales is banned?! It's one of the most powerful cards ever?! Are you kidding me?! While it would certainly solve the problem on the top end, it would alienate and confuse people elsewhere.” Although it may seem hard to believe at the moment, all that stuff is still true. I feel for casual players everywhere who can no longer discard a land to Thirst for Knowledge, and I pity those that will have to explain this event to them—store owners, local TO's, and our poor customer service department. But it came down to risk versus reward, and we have to hope that our casual audience is more resilient than our tournament audience. You can't please all of the people all of the time, although heaven knows we try. We walked out of the meeting planning to ban just the lands (at which point I wrote my teaser article three weeks ago), but some vigilant playtesting quickly showed that such a move would have been a mistake. We made Ravager Affinity decks that ran off Chrome Mox, Paradise Mantle, Blinkmoth Nexus, Aether Vial, and Darksteel Citadel among other things, which were still good enough to win lots of games against other current real-world Standard decks. Unacceptable. The worst thing that could happen, in our eyes, would be for people to come back to Standard, full of hope and under the impression that Affinity was dead, only to lose to a weaker-but-still-potent Affinity deck in Round 1 of Regionals. So we had to keep pruning. The Citadel was the next to go, but it still wasn't enough. Arcbound Ravager—the deck's namesake—could not dodge the executioner's axe any longer. Our now ramshackle Atog Affinity decks were still showing slight signs of life, and the final piece of adding Disciple to the list—although heavily debated—was agreed upon. Of all the cards banned, I feel the fewest tears will be shed for Disciple, for it was quickly becoming one of the most frustrating and hated cards in the game. Six lands, Arcbound Ravager, and Disciple of the Vault—you may see it as overkill, but to us it was a necessity. I could repeat many of the paragraphs above with some of the words changed to cover the Vintage changes, but I think I'd rather summarize instead. Trinisphere is a nasty card, no bones about it. It does ridiculous things in Vintage, especially combined with Mishra's Workshop. As I've said in a previous column, we almost restricted it before it was even released. Now that it has been floating around for a while, the Vintage crowd understands that the card does good things for the format, and bad things to the format. While it does serve a role of keeping combo decks in check, it also randomly destroys people on turn one, with little recourse other than Force of Will. And those games end up labeled with that heinous word—unfun. Not just “I lost” unfun, but “Why did I even come here to play?” unfun. The power level of the card is no jokes either, which is a big reason why I don't feel bad about its restriction. Vintage, like the other formats with large card pools, always runs the risk of becoming non-interactive, meaning the games are little more than both players “goldfishing” to see who can win first. Trinisphere adds to that problem by literally preventing the opponent from playing spells. We don't want Magic to be about that, especially not that easily. If combo rears its head, we'll worry about it later. But for now, we want to people to play their cards. Really. What does all this mean for the future? What's getting banned next? The answers, I hope, are “nothing” and “nothing.” This radical change should fix things for the foreseeable future. We've made significant changes in our entire R&D process over the last couple years—everything from design philosophy to our playtesting regimen have been overhauled at least somewhat since the days of Mirrodin—cold comfort in times like this, I know, but true nonetheless. We aren't making some sort of policy change that will have us banning cards based on perception over reality down the road, so expect business as usual on that front. We made a bold move and can only hope it works out, for our sake and yours. 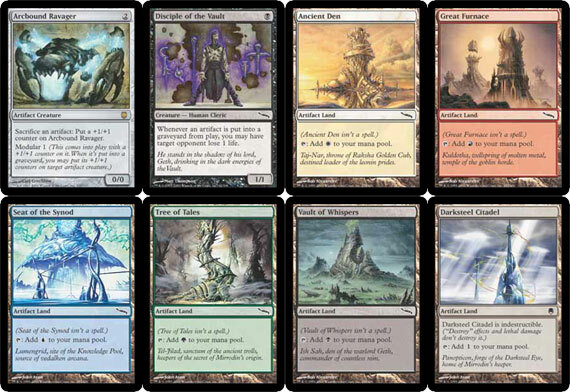 I really, really, really hope you all enjoy Constructed Magic for the next eight months. Which cycle of dragons is the coolest?